Why do I always end up with rotten bananas? EVEN THOUGH we eat them daily, tHIS seems inevitable. sometimes i actually freeze the banana without the skin. i cannot vouch for the vitamin factor of doing this, BUT it’s worked fine in my banana breads. if you find yourself with 5 rotten bananas (and i do mean very black yuCky ones), this is a delicious bread to bake. you’ll need a 9 x 5 loaf pan. 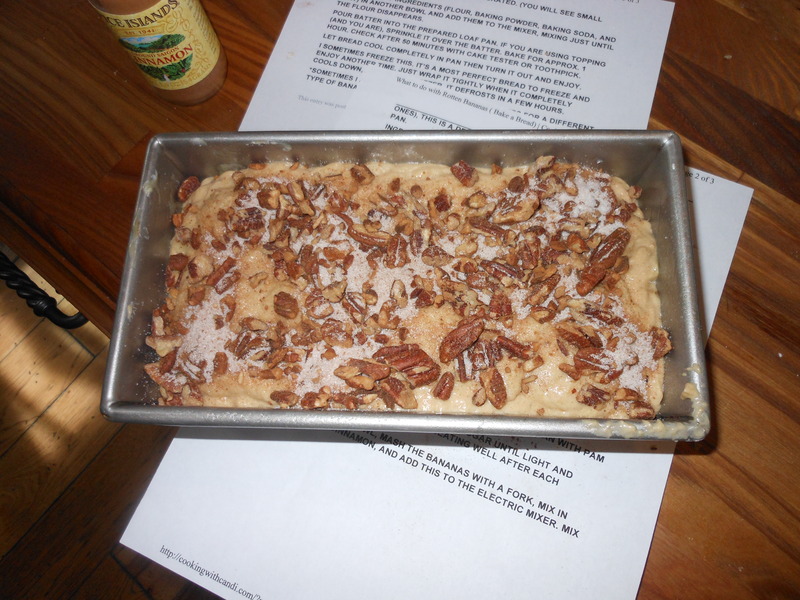 preheat the oven to 350 degrees F. Spray a 9 x 5 loaf pan with pam baking spray, and lightly butter. Using electric mixer, cream butter and sugar until light and fluffy. add the eggs one at a time, beating well after each addition. put your dry ingredients (flour, baking powder, baking soda, and salt) IN ANOTHER BOWL and add them to the mixer, mixing just until the flour disappears. pour batter into the prepared loaf pan. If you are using topping (and you are), sprinkle it over the batter. Bake for appROX. 50 – 55 minutes. check after 50 minutes with cake tester or toothpick. if it needs more leave it in for a few, and keep checking till you get to know your oven. let bread cool completely in pan THEN Turn it out and enjoy. I sometimes freeze this. it’s a most perfect bread to freeze and enjoy another time. just wrap it tightly when it completely cools down, and put in freezer. it defrosts in a few hours. 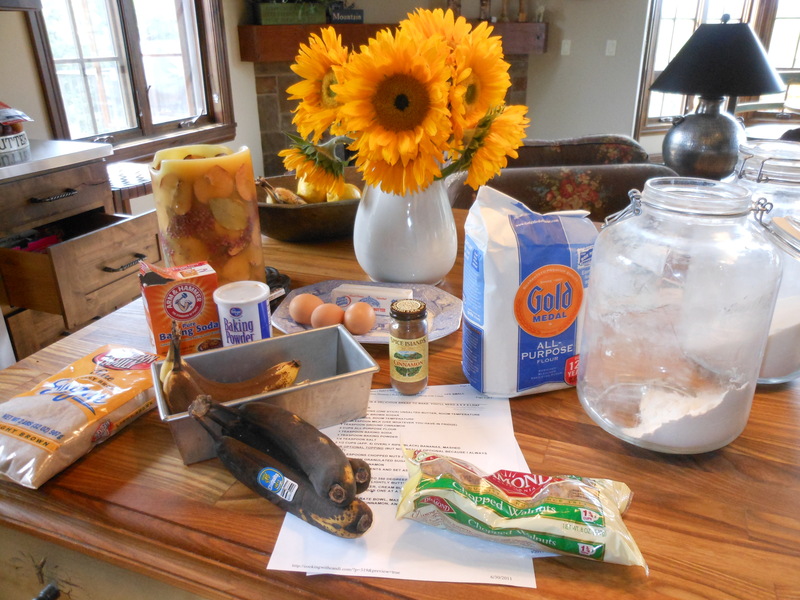 This entry was posted in dessert and tagged banana bread, rotten bananas, rotting bananas. Bookmark the permalink. This is one of my favorite go to banana breads. It has a most delicious crunchy sweet topping and it freezes up so well. I give it a big thumbs up if you’re sitting with rotten bananas and it seems like I always am. If I can’t bake right away I will peel and freeze the rotten bananas for when I do have time for baking, upon defrosting they may be a little watery but they work out perfectly. Enjoy this wonderful recipe! Have a great weekend. I’ve tried the freezing bananas to come back to them for banana bread but they did not work out! A friend of mine always freezes hers but for some reason mine were frothy and foamy when I tried to use them. I’ve been too scared to try again, but I’ll try removing the peel next time I find myself with bananas and no will to bake. they are def watery, but they worked out perfectly much to my surprise! did you peel first? that could be it for sure. try it the other way, I know it’s scary to do it because it didn’t work out for you last time, but it really always works!